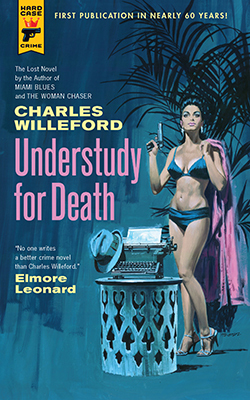 The following is an exclusive excerpt from Understudy for Death, a newly reissued crime classic from Charles Willeford, in which a detective looks into a woman’s supposed suicide, which he suspects is murder. While she fixed the drinks at the bamboo bar with the Micarta top ($98.75 plus tax at all Modern Rattan Stores) I put the paper and pencil on the coffee table in front of me. A good interviewer doesn’t take notes. I had only brought out the paper as a prop to show that I was calling on business. “And here we are.” She sat down on the couch again, facing me. “Why do you keep saying that?” I said irritably. “You’re supposed to be asking the questions,” she said sharply. From UNDERSTUDY FOR DEATH by Charles Willeford, published by Hard Case Crime. Copyright © 1961 by Charles Willeford, reissued by Hard Case Crime in 2018.